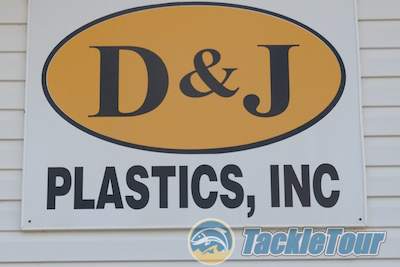 A Look Behind the Steel Door of D&J Plastics, Inc.
Introduction: If you're a bass fisherman, you're no stranger to soft plastic baits. It is arguably, the number one selling bait category in the industry. 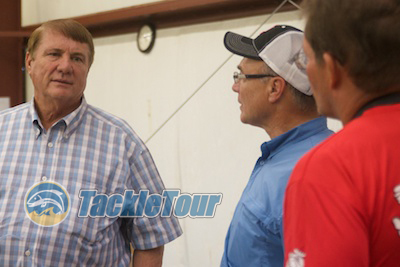 We were recently afforded the opportunity to tour the factory of one of the largest OEM soft plastic bait factories in the US. Located in what has become the soft plastic bait capital of the country, D&J Plastics, Inc. has been in business since 1997. 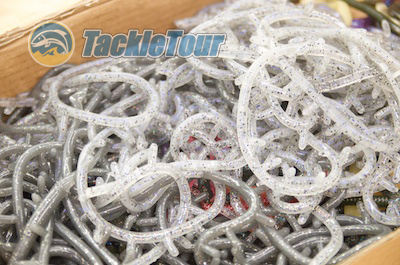 D&J Plastics, Inc. has been producing soft plastic baits for tackle companies since 1997. Though D&J Plastics has been in business for seventeen (17) years, its founder, Dennis Montgomery's experience dates back over thirty to the origins of the soft plastic bait industry and Tom Mann's original Jelly Worm. 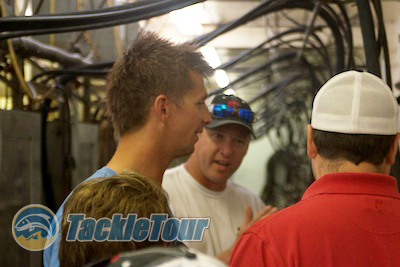 Montgomery was an integral part of the team that put that bait into production and into the mass market. Dennis Montgomery, left, sharing his story with the media for the first time behind the warehouse doors. With the knowledge that comes from all that experience, Montgomery, together with his wife, Joyce (hence D&J), and their two children Scott and Tammy, have built up a manufacturing operation whose daily production potential is up to one million baits! Yearly production at their factory averages 16 billion baits! Scott Montgomery (center) explaining the injection process. Source material is taken from drums on the right side of the image, through the overhead tubing, and into the molds housed in the machines to the left.. The machinery behind these astronomical numbers includes over a dozen injection molding machines that when outfitted with that can be outfitted with any number of aluminum molds that define everything from crappie mini-tubes, to ten-inch long worms and creature baits. At full capacity, these machines are capable of punching out close to seven hundred (700) baits or one hundred bags of bait (depending on the distribution) per minute. Depending on the complexity of the bait, a subsequent mold like this costs manufacturers $7k - $10K to produce. Naturally, the baits don't go straight from the molds into their packaging. 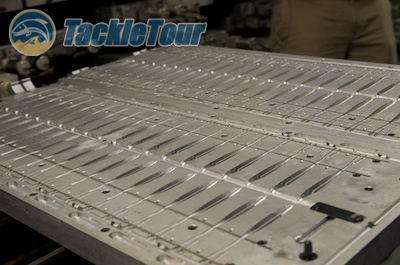 When baits come out of their molds, they are all attached via a central branch representing the left over plastic from the mold's feed line. They are pulled out of the mold as one unit and hung to dry overnight. 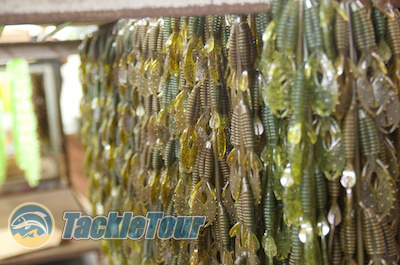 Fresh out of their molds, baits are then hung to dry overnight before being separated and inspected for quality. The next day, baits are separated from this central branch of plastic and then each individually inspected for quality. Quality is certainly the key at D&J Plastics. Ever notice how some plastic baits, when pulled out of their packaging have an odd, petroleum based odor? This speaks to the quality of the base materials used in the soft plastic formula. A look at discarded central branches left over from production. Next Section: What happens to the discarded material?